A new video has been released from inside the Costa Concordia wreckage which has been stuck on the rocks of the Italian island of Giglio since January 2012. The Telegraph has released the new footage which shows divers going inside the ship. They go into sunken areas and areas which were previously underwater before the ship was put back in its up right position last year. The new footage taken by divers looks like something you usually see in the movies but sadly its real life. The video shows many different public spaces including bars and walkways which would have usually been full of passengers. 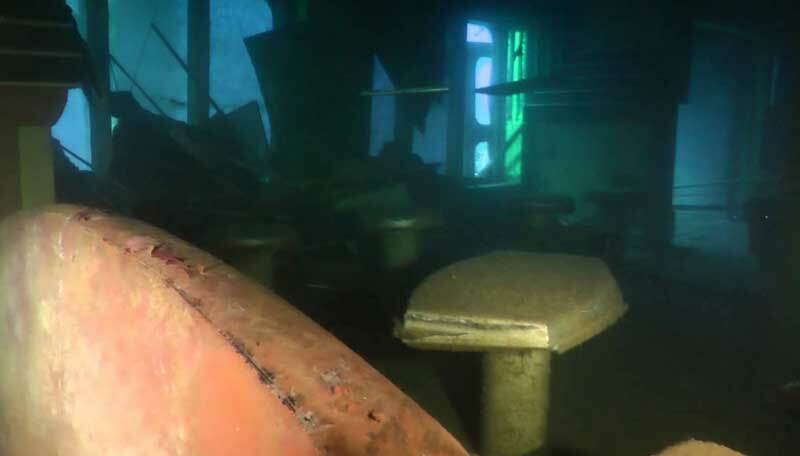 All the devastation and rust is shown throughout and one particular part of the footage shows the Concordia’s information desk which is usually a hive of activity on cruise ships. That space in particular is very similar to other Costa and Carnival built ships so if you’ve ever cruised on one of them it feels strange. The upper half of the main atrium is out of water and it shows all the rotten artwork and decor which used to wow passengers when they arrived onboard for the very first time. The elevators are all rusted and everything looks so still. The Police Divers filmed the footage as news has been reported recently that the Costa Concordia is to be towed to Genoa to be dismantled. To do this the ship is to be refloated beginning in mid July. To find out more about the towing and can see Cruise hive’s previous report.